When I was a wee lass, my very favorite cake was my father’s gingerbread. I can remember an early birthday when I insisted on gingerbread. It’s a very dark cake, so all my 4 and 5 year old friends presumed it was chocolate. You should have seen their little faces screwed up in disbelief when they took the first bite. It seems gingerbread is no longer a familiar childhood taste. But once upon a time, its spicy rich molasses flavor was beloved of children everywhere. 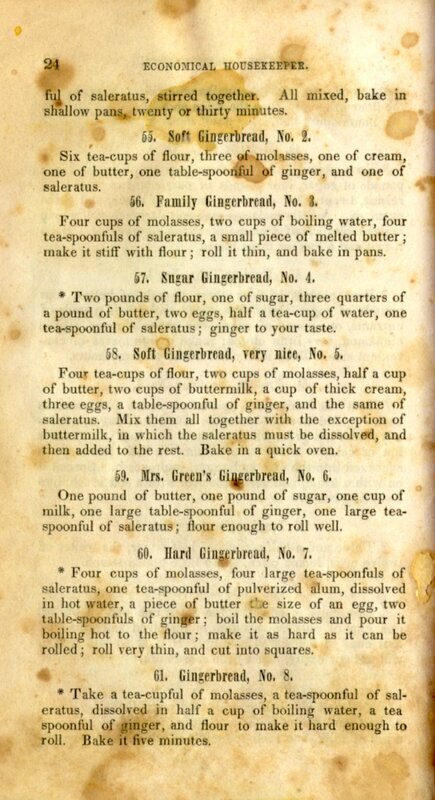 Here’s a page from The New England Economical Housekeeper, and Family Receipt Book, by Esther Howland, 1845, featuring a variety of gingerbread receipts. (Thanks to Feeding America: The Historic American Cookbook Project for making this available.) If you want to try any of these, just substitute baking soda for the saleratus. Godey’s Lady’s Book (one of my favorite magazines, in case you hadn’t noticed) was instrumental in popularizing the Christmas tree in America. 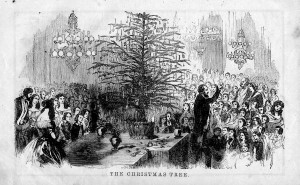 They (re)published a British illustration of Queen Victoria’s Christmas tree in 1850 — by 1851 the first Christmas trees were being sold in New York City markets. Of course Christmas trees were around before 1850, particularly in the homes of German immigrants. But it took an engraving of the queen and her German-born husband, Prince Albert, around their Christmas tree in Windsor Castle to convince the average American WASP that this charming custom should be universally adopted, whether in the home or in public displays. Having just finished writing out my final Christmas card, I am inspired to share the following notes on the history of this delightful (if time consuming) custom. 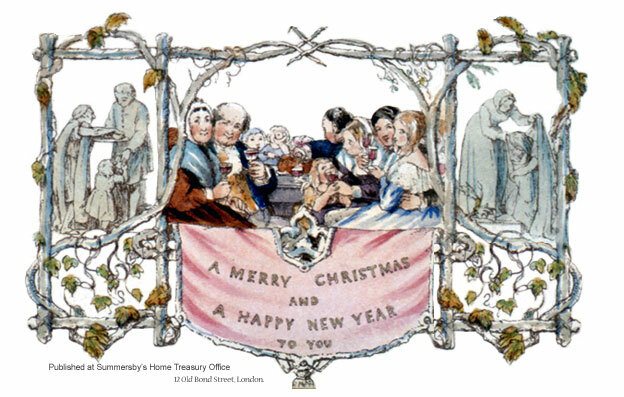 This is an image of the Christmas card created by Englishman John Callcot Horsely in 1843. The relatively modest run of 1,000 lithographed cards were hand colored. It is generally believed to be the first commercially produced Christmas card. The perfection of lithography and the invention of chromolithography (with color) in the first half of the 19th century was largely responsible for the development of holiday greeting cards; in the 1850s, Esther Howland of Boston began producing the first Valentine’s Day cards. Seems that Boston was a hotbed of greeting cards. 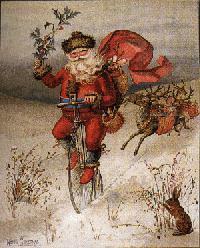 Louis Prang, late of that city, introduced the first line of American made Christmas cards in the 1870s. I’m pretty sure this is one of his cards. It’s a whole new side of Santa Claus, and I’m admittedly tickled by it. Christmas is coming, and with it, the seasonal urge to imbibe. In anticipation of the annual holiday party at the Museum where I work, we decided to try out a new punch receipt. Naturally it’s from Jerry Thomas’s 1862 masterpiece, How to Mix Drinks, or the Bon Vivant’s Companion.